So helpful! 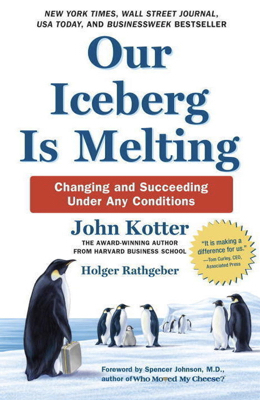 John Kotter and Holger Rathgeber use a fable of an endangered Penguin colony to put feet to Kotter's classic 8-Step Change Process (found in Leading Change). As Kotter and Dan Cohen have pointed out in The Heart Of Change, data and statistics alone will not convince people to move from "here to there." For change to connect and stick, the need has to penetrate the heart. This book helps do just that. Our Iceberg Is Melting leverages the power of story to highlight the change process. It introduces characters and language that help readers to identify and discuss the change process as it relates to their context. One may pass this off as simply just another story in the business fable literature. Don't do that. This story, these characters, and the concepts they represent will help anyone needing a little (or a lot) of assistance in bringing about change. 1. The book: It marries John Kotter's world-class change and leadership expertise with Holger Rathgeber's world-class practitioner focus. The result is a very helpful tool. 2. The fable: It is interesting, fun, and gets the job done. 3. The "how to": The authors provide practical ideas for maximizing this volume in any setting. 4. The insight: The book is loaded with insight into organizational complexity and the human condition -- and how to navigate it. 5. The website: www.ouricebergismelting.com provides plenty of help to take your learning to higher levels.